A Small Town Tradition and a Giveaway! 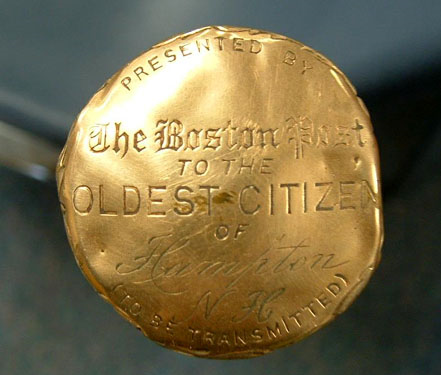 For more than 100 years, the Boston Post was the most popular daily newspaper in New England. Founded in 1831, it published until 1956. Its circulation peaked in the 1930s at over 600,000, when it was one of the largest daily papers in the U.S. By the time it folded, competition had cut seriously into its territory, and the Post closed out with a circulation of about 255,000. Over its lifetime, the Post’s owners undertook various publicity campaigns. The most famous began in 1909, with the presentation of several hundred ornate, gold-headed canes to New England towns (sources disagree on how many there were, but I'm going with a source I trust, which says 431). In my research, I wasn’t able to discover how the towns were chosen, but not every town received one. Selectmen were elected officials in the local government. In the towns that received canes, they were to give them in a ceremony to each town’s oldest living man. That man would keep it until he died, when the family was to return it to the town, so that the cane could be passed to the next oldest male resident. In 1930, this custom was modified to include women. Boston Post Cane, photo courtesy of Lane Memorial Library, Hampton, N.H. The canes were fashioned of ebony wood. Though locals sometimes refer to them as “gold canes,” only the round head of each was 14-karat gold. 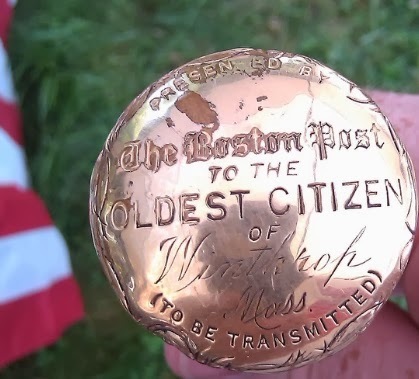 The flat top of each one was inscribed with the words, “Presented by the Boston Post to the oldest citizen of,” followed by the town’s name, and the words, “To be transmitted” in parentheses. 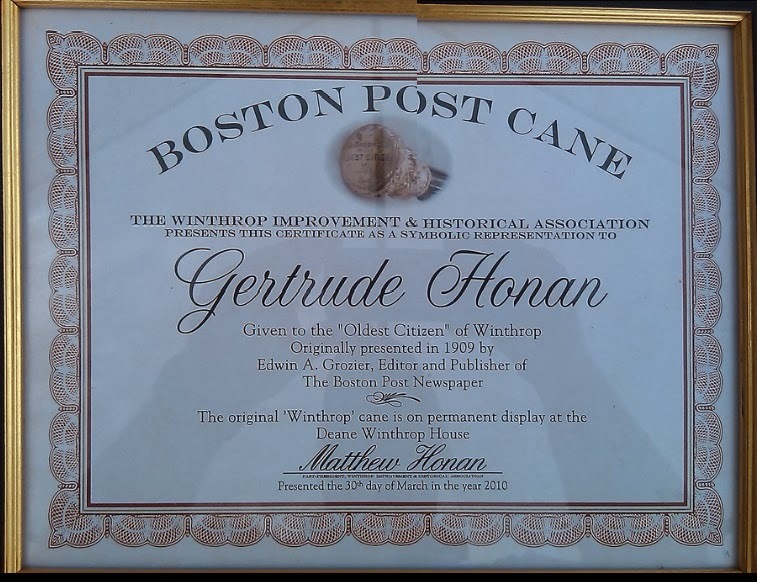 Every time a new honoree received one, the Boston Post got a new shot of publicity. Many towns in New England still carry on the tradition of the Boston Post Cane with the original canes they received in 1909. When I worked for the Central Maine Morning Central in the 1980s and 1990s, I attended several of these ceremonies, as a couple of the towns in the area I covered still had their canes. The presentation was intended to show respect, and the elderly recipients always considered it an honor. Some towns now keep the original cane on display and present a replica, plaque, or lapel pin. A lot of the canes disappeared over the years, as sometimes the holder’s family forgot about it, or the town officials had changed and the new ones didn’t remember to ask for it. A few are known to have been stolen or destroyed by fire. One was “lost” for three years and then found in the town’s vault, where it had been all along. A few of the canes have shown up at auctions and estate sales, but many are lost. More than a hundred towns have reportedly retired their canes. Hampton, New Hampshire, stopped giving theirs out in the 1970s. Some people were confused about its meaning, and some elderly residents “feared getting the cane,” a later town clerk reported. Some people reportedly thought they would soon die if they accepted it. The Hampton selectmen also grew tired of conflicting claims of who was the eldest resident. Their cane is now on display in a glass case, as was the one in Clinton, Maine, where I used to live and photograph the recipients. Clinton's, however, was stolen from the town office in 2011. Also for your enjoyment, today I am giving away a copy of one of my romantic suspense books set in Maine. Leave a comment to be entered in the drawing for either the print or e-book version of On a Killer’s Trail. The winner will be drawn Feb. 28. Susan Page Davis is the author of more than forty published novels. A history major, she’s always interested in the unusual happenings of the past. She’s a two-time winner of the Inspirational Readers’ Choice Award, and also a winner of the Carol Award and the Will Rogers Medallion, and a finalist in the WILLA Awards and the More Than Magic Contest. Visit her website at: www.susanpagedavis.com . Susan, what an interesting post. I never knew of The Boston Post Cane. I can only I imagine how honored people were to receive these. Your short story is great! Thank you for sharing. Thank you, Melanie! I was really sad to learn my town's cane had been stolen! Thank you Susan for your research and the telling of this story, I love to find out new facts on this site. I too had never heard of this cane and the oldest citizen getting it. How proud they must have been to walk down street with this cane. There are not of exciting things for older folks and I am glad they had this. thanks for sharing would love to read your book. You're welcome, Paula. I don't think most people outside New England knew about. It's one of those quirky things that some people hold dear to their hearts. Susan, What a beautiful post . I love that seniors were given such an honor. I have never heard of this. I am glad the tradition lasted as long as it did. how proud the original recipients must have been. I wish we still had a way to do that today but know that would be impossible. I love to be around seniors, they have so much to offer, Even if it was for publicity I'm sure at that time it was still an honor to get one. thank you so much for the post and giveaway. If I were to win print please. Thanks, Jackie! I had a lot of fun writing this, and the contacts I made getting permission to use the photos were interesting too! The photographers were very generous in sharing so long as we gave credit, and I love being able to show you what these canes looked like. Eliza, every month I wonder, "What will I write about next time?" But you know, every month some oddity from history comes to my attention, and so far I haven't run out of topics. It's readers like you that keep us going here! Thanks for coming by to share the experience. Glad you stopped by, Betti. I totally agree that it was a nice tradition. What an interesting piece of history! I am so glad you were able to include pictures of these canes. It is nice to know that some towns still carry on this tradition in various forms. Thank you for sharing this history with us today, Susan! Thanks, Britney. As you can see, some have had a few "hard knocks." It makes me sad that it has become unwise or even dangerous to keep them out and let them be used by the people who are honored. I've never heard about the cane tradition, so cool! Thanks for the interesting article. Glad you enjoyed it, Merry! Extra thanks for reading the short story, Sharon! I had fun writing it. Thanks for such a truly fascinating post, Susan! I bet the stories would be so interesting if, like walls, these old canes could speak! Cane and Mabel was very cute! Thank you so much! I do think it would be interesting if interviews with elderly recipients of the canes were compiled. Flowers are great, Maxie! I don't know of any other custom where the oldest resident of a town was honored regularly.